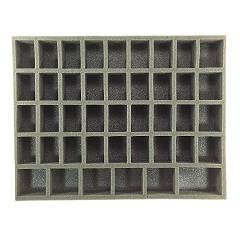 This tray is made for 32mm bases. It will hold 32 standard marines, nine characters or models with dynamic poses and one banner. 1.5 inch (38 mm) thick tray with 32x 2 x 1 1/4 inch (50 x 32 mm) cut outs, 4x 1 3/4 x 2 inch (44 x 50 mm) cut outs, 5x 2 x 2 inch (50 x 50 mm) cut outs and 1x 3 x 2 inch (76 x 50 mm) cut out.